One of the details that Palm refused to address during their Keynote and also during their one-on-one time: battery size and battery life. Well, let's answer one of them right now: the size of the battery will almost surely be 1150mAh, because it uses the same battery as the Palm Centro and the Palm Treo 800w. 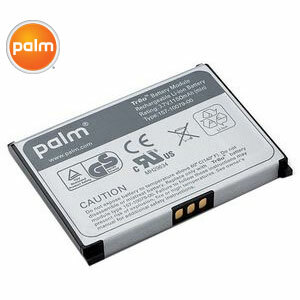 During our one-on-one, we asked Palm to remove the battery door, pretty much expecting them to refuse. Instead, in a sign of their new openness, they happily did and I got a peek at the battery. Though Palm had to follow their rule of not talking battery, they did admit that, yes, I wasn't wrong when I said that the battery looks identical to the Centro battery. Now, it's possible that Palm will try to cram more milliamps into the battery space (ala the Extended Battery for the Centro and 800w, but the bottom line is we're likely looking at a 1150mAh battery in the Pre, 1350 mAh at the very best. Update: Jenn from Pocketables reports in the comments on on her sit that the the battery is 1200mAh, which is certainly possible -- but the overall size of the battery definitely looks the same. You might be thinking that's a little small and you're not wrong about that -- but listen: we have literally no idea how the webOS handles batteries, power management, and the like. Until Palm releases the device, we're not going to know how it performs in real life. Special note: although the Treo 800w doesn't have stellar battery life, it has a much longer battery life than pretty much any other Windows Mobile device with similar specs and similar battery size. When Palm says that "Mobile is in our DNA," they mean it. They have the know-how to pull every quanta of energy out of that battery efficiently, so we're still anticipating that the Pre will have more than acceptable battery life.